What's this world coming to? People actually rap about preparing for a movie-going. SNL's Chris Parnell and Andy Samberg rap about the Chronic (WHAT!) Cles of Narnia on "Lazy Sunday". And the West Coast fires back with "Lazy Monday". I was so taken up with classical music (again) that I took out a year's subscription of the Willoughby Symphony concerts, plus the Sunday Soiree series. The first concert for the year entitled Romantic Visions didn't go too well for me though. For one, I got to the venue 5 minutes late, after a sprint from the parking lot. The ushers won't let me in until the first piece was over. I was sweaty and panting, and when I got in, they wouldn't let me take my pre-assigned seat as it might disturb other people, so I had to settle for the back rows. What upset me was the fact that other late entrants were heading straight for their seats. One of the ladies was watching me closely so I can't make my move. But once the orchestra started playing again, these little things don't matter anymore. Now I actually prefer the back seat because you get to see and hear the orchestra playing as a whole. Special mention goes to soloist Alexey Yemtsov, who played Grieg's Piano Concerto in A Minor quite nicely. He also treated the audience to a couple of encore pieces, which I was not able to identify. On my night flight back to Sydney, I decided to watch something slow - something like April Snow (a.k.a. Oechul). Felt a bit like In the Mood for Love, but not quite. 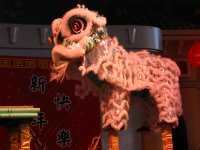 The slow pacing is the same, but ITMFL has more tension and electricity. April Snow stars Korean screen favourites Bae Yong Joon and Son Ye Jin. They first meet at a hospital in Samcheok where both their spouses were involved in a car accident and in critical condition. His wife and her husband were in the same car. They later find out that their spouses were college classmates and had been cheating on them for quite some time now. During this emotional and painful time, In-su (Bae Yong Joon) and Seo-young (Son Ye Jin) find solace in each other's company. They became closer as they kept on bumping each other at the hospital, at the hotel, and the cafeteria, at the pharmacy, etc. One time, after having a drink too many, Seo-young wondered out loud if they should have an affair to get back at their spouses. It didn't happen immediately, but as fate would have it, that's what eventually happened. If I were In-su, I would've taken up Seo-young's offer right then and there. In between feeling guilt and happiness, the couple even organized a romantic getaway where they can be together openly. During their shared vacation, Seo-young's husband Kyung-ho dies in the hospital. She feels all the more guilty for not being at his side during his last moments, so she ends the affair with In-su. In-su goes back to caring for his wife Su-jin until she fully recovers. Then, he confesses everything to her. Cut to spring. Does it snow in April? It does in romantic Korean movies. In-su reminisces about his winter fling with Seo-young. The movie ends with In-su driving to Samcheok with a smile on his face. Seo-young is on her way there, too. Ah, I think I know how the story ends even though it was not shown. You sly dog, In-su. Did you tell the wife? For a change of tempo, I watched The Constant Gardener next. Apparently, even big-name stars such as Ralph Fiennes and Rachel Weisz are not enough to keep me awake. Based on John le Carre's novel, the plot is a bit slow-moving and has a political slant. Story is about a greedy capitalist pharmaceutical company exploiting the helpless Nairobians with tuberculosis for the purpose of testing and marketing an experimental drug. Tessa (Rachel Weisz) is onto the pharmaceutical company, and thus had to be silenced. Justin Quayle (Ralph Fiennes) doubts the cause of death of his wife, and travels around the world looking for answers. Most of the characters in this movie are cardboard caricatures: the fiery activist, the reluctant hero, the scheming CEO, the conniving politician, the backstabbing friend, the wisely spy, etc. The cinematography is very nice, as this is Nairobi, Africa. I'm getting tired of Fernando Meirelles' jarring and messy camerawork though. It worked fine for City of God, but not in this one. The cable car ride was quite an experience. 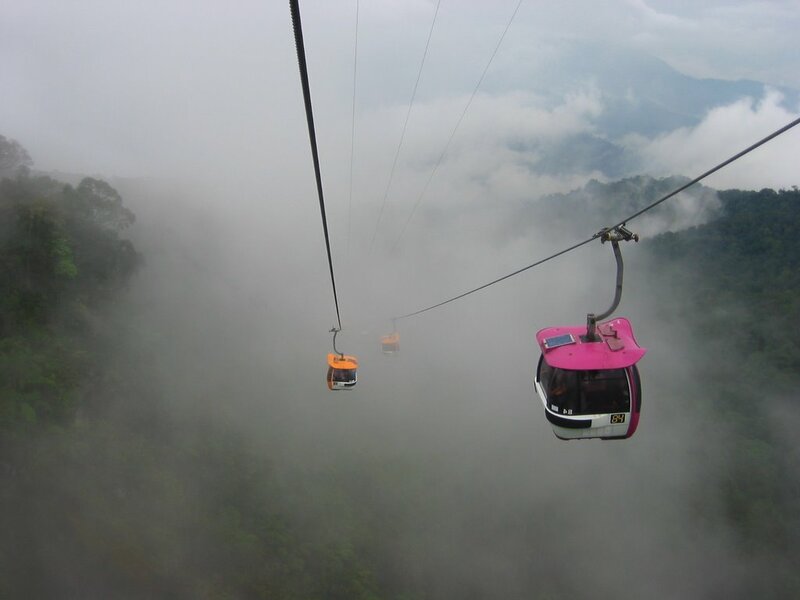 Said to be the longest cable car system in South East Asia spanning 3.38kms., and the fastest in the world, it travels at a maximum speed of 6 metres per second or 21.6km per hour. It still feels slow to me, especially if you're stuck in an eight-passenger gondola for 20 minutes with nothing to do. I started taking pictures, but had to stop when we were told not to stand up. As the pod goes up and up above the rainforests, it becomes eerily silent, and everybody looks around waiting for something to happen. When you finally get to see the whole of Genting Highlands, you can't help but feel awed. Imagine you're in the middle of nowhere (actually at the peak of Titiwangsa Mountains), and they you have a full-service resort with cable-car system, indoor and outdoor theme parks, golf courses, casinos, plus a string of half-a-dozen hotels. And not just any hotels. One of them, the First World Hotel has 6,300 rooms. 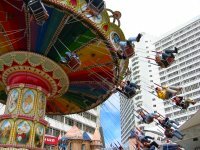 Instead of heading straight for the theme park, I decided to explore the place a bit. The place is HUGE. One can easily get lost if there are no signs around. 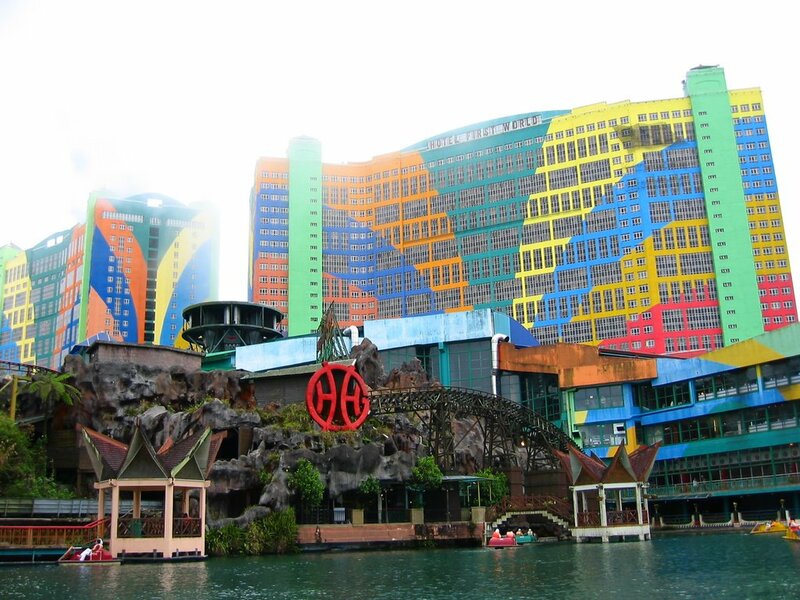 Casino de Genting is the only legal casino in the whole of Malaysia. From my quick survey, majority of the patrons are Chinese. 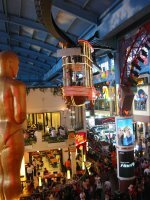 I may be wrong, but I think Malays are not allowed to enter the casinos because of their Muslim faith. Started my tour of the theme park in the afternoon. I was too lazy to queue up for the popular rides, so I tried the scary ride called Pirate Train. When I got out 1 minute later, I was LOL. The ride was so pathetic - skeletons with glow-in-the-dark paint and a scratchy recording of scary sounds. I tried the Boating paddleboat next for some leg exercise. Tried the Spinner twice because it was so much fun. Even managed to get a video footage while I was being spun around. 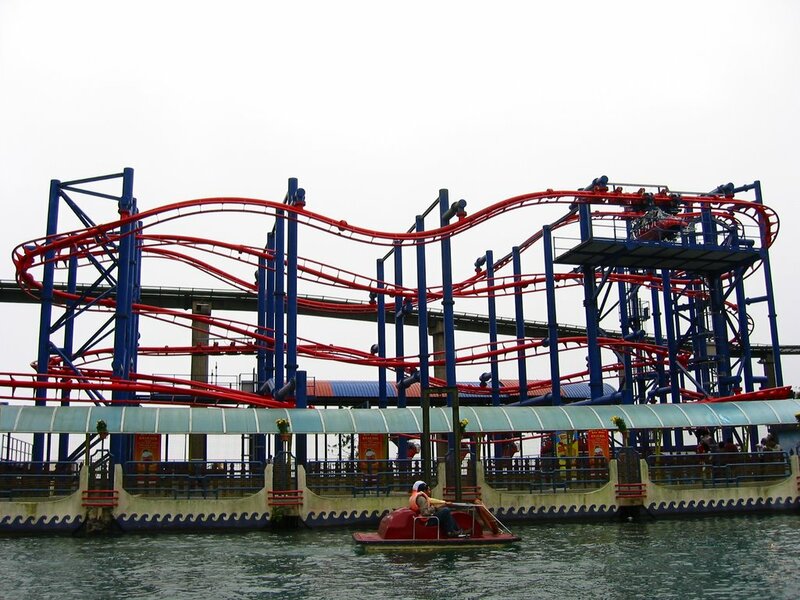 Next up is the Cyclone roller-coaster ride. No 360s, but very fast with lots of twists and turns. I was tempted to bring out my camera and take some videos, but thought the better of it. Then, I tried the Grand Prix Fun Kart. The last time I tried go-karting was back at the Carmona Circuit in Cavite. 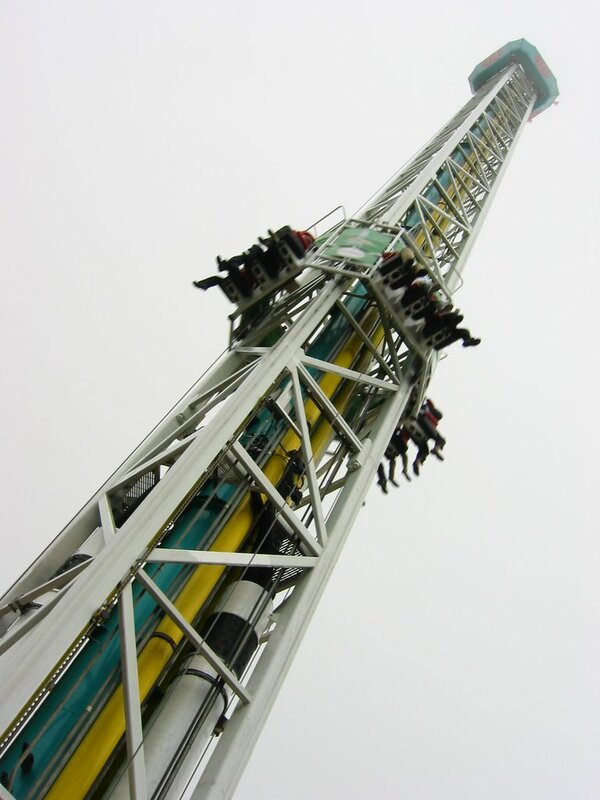 Pure adrenaline-pumping fun! Can't say the same for this one. The cars are really slow - maybe 10kph. It was pedal to the metal, I'm driving with one hand with the other taking a video. Next, I lined up for half an hour for the Space Shot. 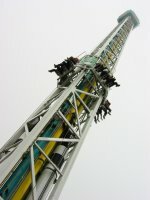 It's a rapid vertical ascent and descent ride that takes 12 people at a time. Looks fun and easy from the ground. It's a different thing when the rig brings you up 185 feet to the air, and everything below you becomes so small, and you can't see very clearly because there's mist and fog about. Yes, it's that high up. Without a warning, you're in free-fall. Your buttocks leave your seat. You pray that the seatbelt will hold. 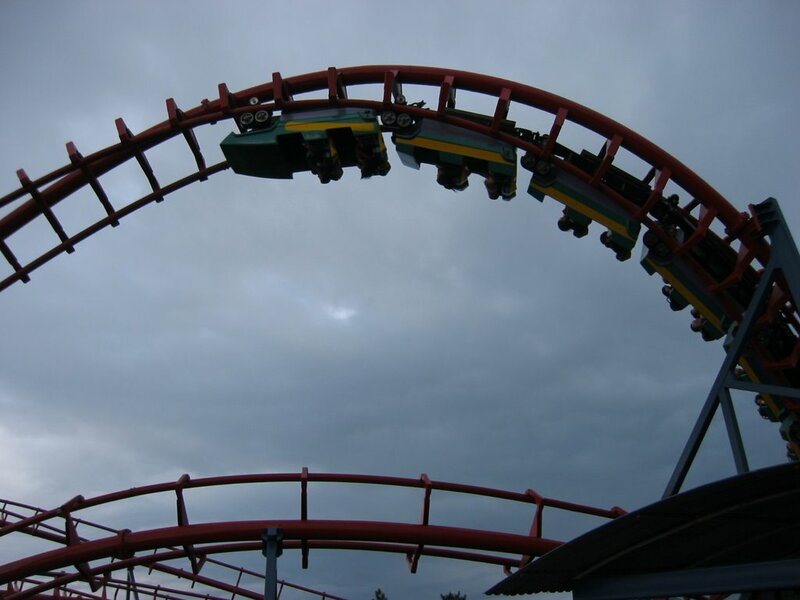 You wish that you've gone to the toilet before taking the ride (just in case). You scream until your heart gets stuck in your throat. Then it's all over. You give a smile to the little girl seated beside you - the one who didn't scream or even flinch a bit. 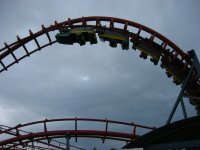 After the Space Shot, the Corkscrew roller-coaster with the 360-degree turns and the Flying Coaster where you fly around in a prone Superman position, feels like nothing. 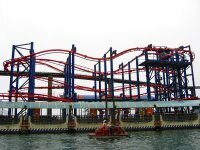 That's just half of the ride in the outdoor theme park, but as luck would have it, it started to rain. 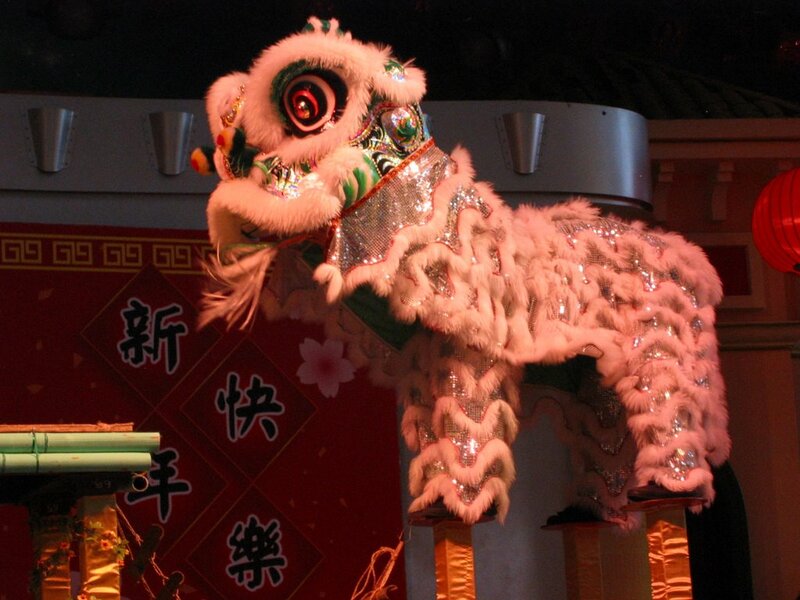 Spent a few hours exploring the indoor theme park and watching the lion dances at the First World Plaza. Lost track of time and missed my bus as the cable car was running slow due to poor visibility. Good thing the driver of the next bus let me on. 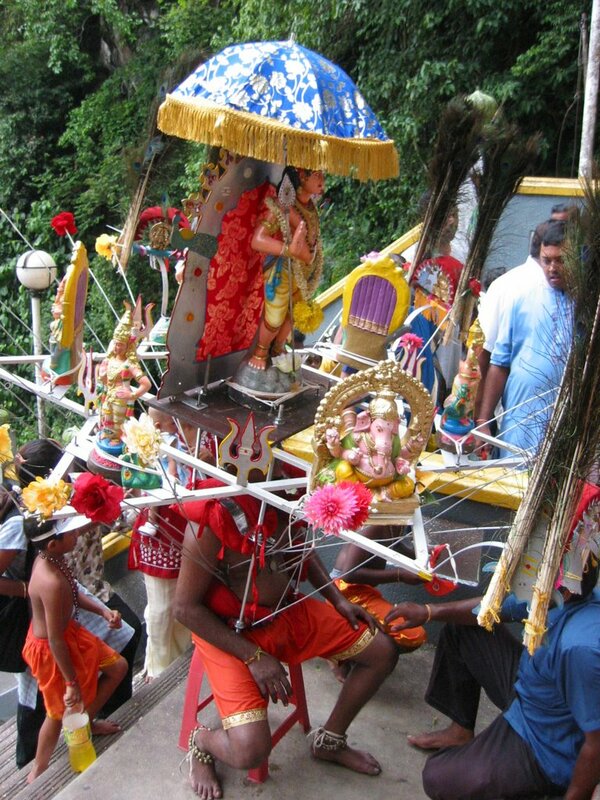 Thaipusam is a Hindu festival that is celebrated on the tenth month in the Hindu calendar. It's a celebration for the son of Shiva (Lord Subramaniam) and the union of the Pusan and the Brihaspati stars. It's just my lucky day to be in KL when the Thaipusam festival happens this time of year. 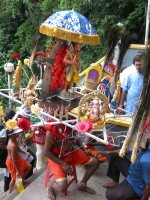 From what I've gathered, the street procession starts around midnight at the Sri Maha Mariamman Temple in Chinatown, where the statue of Lord Subramaniam and his consorts, Valli and Theivanai are placed on a chariot and drawn by bullocks. 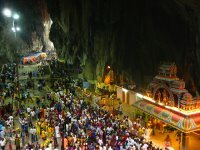 The colorful procession terminates 13 kilometers away at the Batu Caves. 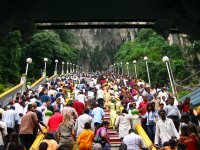 Yes, that Batu Caves with 272 steps leading up to the massive limestone caves. KL at midnight is not the safest place for a tourist to be about, but I figured with so many people in the procession, I should be safe. But alas, it is not to be. Our network topology reconfiguration from midnight Wednesday going to Thursday didn't turn out well. We had to roll back all our changes, and make another attempt that same night. It was better the second time around, but by the time we finished the work, packed up, and got back to the hotel, it's 6am. 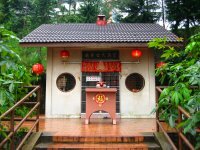 After a very early breakfast and some much-needed sleep, it was already 2pm when I and my colleague left for Batu Caves. 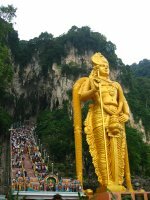 The last time I went to Batu Caves was by the local city bus. Not recommended if you can help it. This time because of the festival, there are some better transport options. 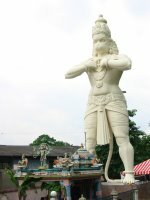 We took the KTM train to Sentul, and from there, transferred to another train that took us all the way to Batu Caves. The trains were packed with Indians. I've never seen so many Indians in one place at one time. 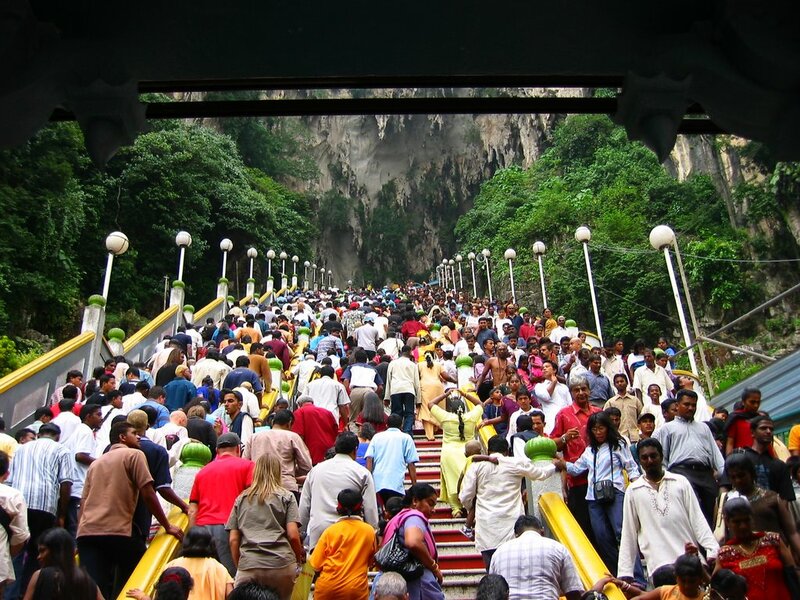 Well, that's until we actually got to Batu Caves. 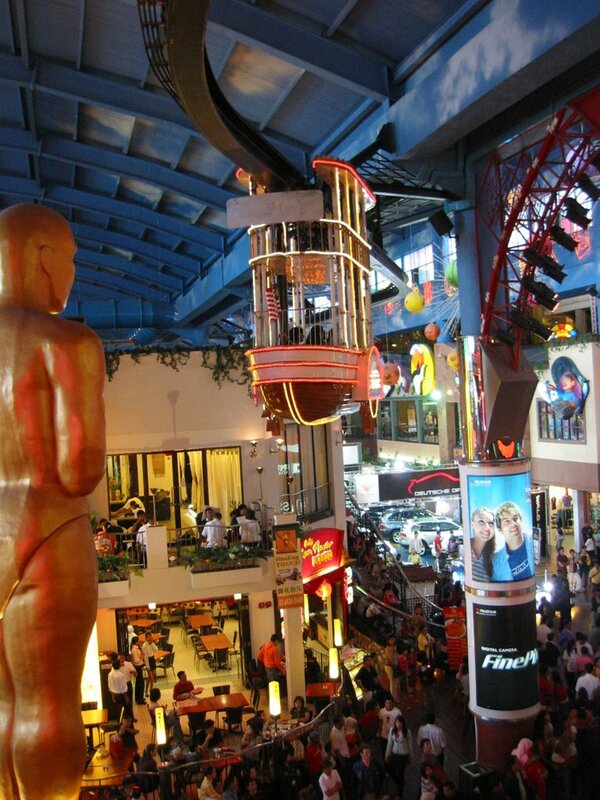 It became little India. The place is so packed I had trouble breathing. There's food stalls, handicrafts stalls, shops selling Indian CDs and VCDs, etc. It's already late afternoon, but there's still a steady stream of entranced devotees carrying kavadis into the Batu Caves. 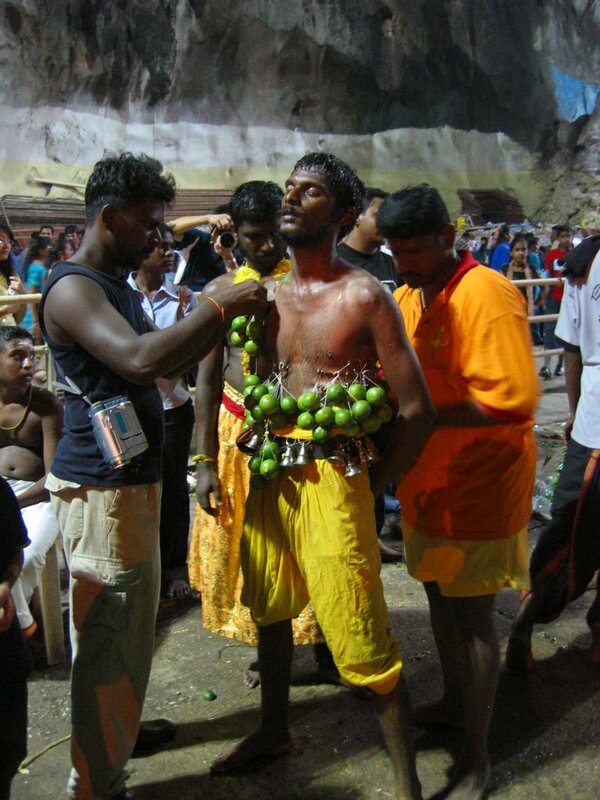 Other worshippers hook limes, oranges or coconuts onto their bodies. That must hurt, especially when you have to carry them up 272 steps into the caves. Women carry jugs full of milk. 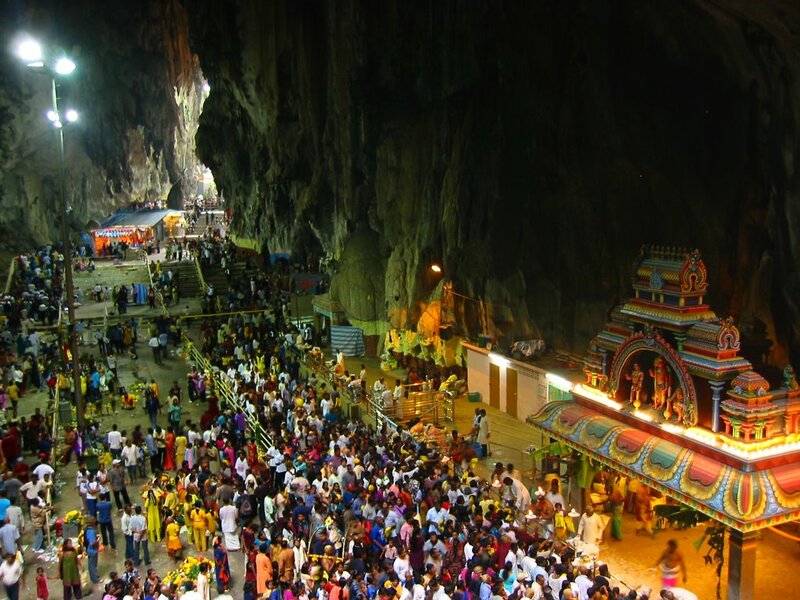 Once inside the caves, the Swami removes the hooks, spears, the kavadi, etc. The milk is poured out, and the devotee's vow is fulfilled, his sins cleansed. First movie for the flight is Wallace & Gromit: The Curse of the Were-Rabbit. I couldn't have chosen a better film to watch. It's the lovable duo's first feature-length outing and it doesn't disappoint. The guys at Aardman Animations did a crackin' job with this one. 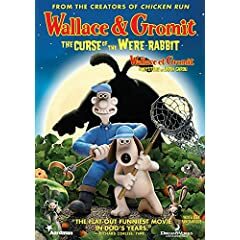 Wallace and Gromit has a vegetable-protection agency called Anti-Pesto, and they go around catching these cute rabbits that threaten the townspeople's crop. Their basement is started to get crowded, so Wallace had this bright idea to "brainwash" the rabbits so they wouldn't like vegetables anymore. Something goes wrong with his mind-machine and a monster is created, who eats everything in sight during a full moon. It's up to Wallace and Gromit to capture the were-rabbit and win back their reputation and the town's respect (and Lady Tottington's affections) before the Giant Vegetable Competition. I just loved the part when Gromit sacrificed his precious giant melon to use as bait to lure the were-rabbit. And when he actually cried when Wallace was unconscious and he thought he was dead. That dog with no mouth can be quite expressive. The bunnies were very cute - I can't imagine why Victor Quartermaine would want to shoot them. The animation work is quite detailed - in some shots, you can actually see some fingerprints. The humour is definitely British and a bit dark. There were a couple of allusions to King Kong and An American Werewolf in London. Non-stop fun and action till the very end. Next up is Tim Burton's Corpse Bride. I pretty much liked everything by Tim Burton, but this one disappointed me a bit. I expected more from the story department, but this one fell short. The sets and the animation is still classic Burton though. Another Tim Burton touch - Johnny Depp and Helena Bonham Carter play the lead voices. Story is about a young man from a nouveau riche fish family, who is forced to marry the daughter of an old-rich bankrupt royalty. The families came to this agreement because the Van Dorts needed the class, while the Everglots needed the cash. Things didn't go well for Victor Van Dort at the wedding rehearsal because he was too nervous. He walks into he forest and there he practices his wedding vows. Finally he gets the vows right, and puts the ring on a finger-shaped twig in the ground. Little did he know that the twig is actually the rotten finger of a murdered girl, who rises up from the ground and claims to be his lawfully-wedded wife. Victor is whisked to the Land of the Dead by the Corpse Bride, and everybody gave him up for lost. Victoria Everglot's parents managed to find a lord to take Victor's place at the wedding. Turns out that Lord Barkis Bittern was the bad guy who is supposed to elope with the Corpse Bride (before she was a corpse), but later murdered her and left her for dead. Meanwhile, Victor was so moved by his new bride's story that he decided to marry her for real. It was HER turn to be touched by his sincerity, so much so that she declined Victor's marriage proposal at the altar, and insisted Victoria take her place. Well, not before the ghosts and the ghouls dispatch off the vengeful Lord Bittern first. Took a break from stop-action animation, and watched an art film by Singaporean director Eric Khoo. 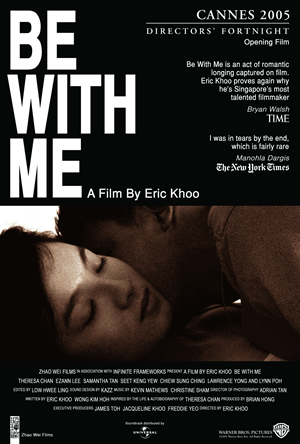 Be with Me premiered as the Director's Fortnight selection in the 2005 Cannes Film Festival, and was allegedly given a 5-minute standing ovation. Personally, I don't find it that good. It's actually composed of three intermingling stories: a shopkeeper who's slowly going into depression after the loss of his wife, a security guard who's in-fat-uated with a sophisticated lady executive, and a pair of cute lesbian schoolgirls who got to know each other via the Internet. Then, you have a bonus story of the courageous deaf-and-blind Theresa Chan, whose life story inspired Be with Me. One thing you'll immediately notice about the movie is the lack of dialogue - only 3 minutes worth of speech in the 93-minute movie. I can't recall any soundtrack either, just people going about their daily lives without talking much. The girls flirt with each other using SMS and instant messages. The shopkeeper thinks about his deceased wife all day long. His social-worker son assists Mr. Theresa Chan with her groceries, but they communicate via finger-writing on the palm. Fatty Koh monitors Ann on his security cameras all day, and at night, he stands outside her flat watching her. My only complaint with the movie is that transition from one story to another is not seamless. There were times when the movie concentrates too long on the Theresa Chan angle, and you wonder, "When are those two cute girls coming up onscreen?" Seriously, I think the movie should've simply concentrated on the Theresa Chan and lonely widower threads, since they are strongly linked by the social-worker son anyway. The other two stories are just fodder. One time, the son can't make it to his 8pm appointment with Ms. Chan, so he calls up his Dad to fill in for him. For some time now, his Dad has been the one cooking meals for Ms. Chan. He's also reading his son's translation of her life story, and it's somehow slowly bringing him out of depression. So Dad commutes to Ms. Chan's place. While Ms. Chan was preparing the dishes in the kitchen, the Dad suddenly remembered the moment his wife died in the hospital, and started weeping silently on the dinner table. 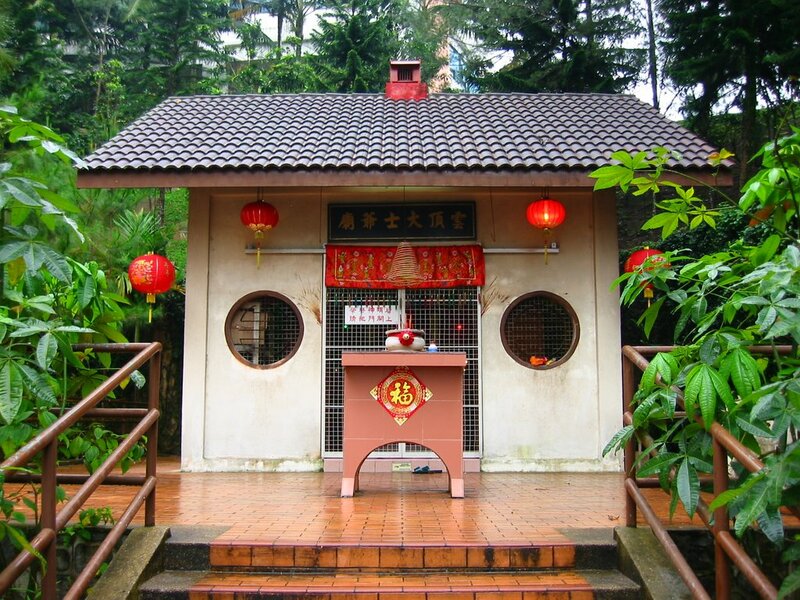 Ms. Chan approached the man, and cradled his head in her arms to console him. Such a powerful image. Too bad things didn't work out for the girls Jackie and Sam, and Fatty Koh and Ann. Sam decided she wants the "real thing", so she dumps Jackie for Brian. Jackie can't take the blow and decides to end it all by jumping off the building. Fortunately (for her), Fatty Koh, who was on his merry way to deliver his love note to Ann, broke her fall. He died of massive head injury. Ann read about it on the local papers while drinking coffee in a cafe. I'm not sure if Ann even knows the guy. Sheesh!